Cylinders may be refilled. Please contact Slide Products for details on this program. 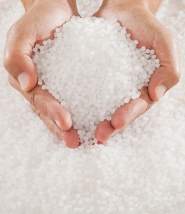 All cylinders, 1-gallon, 5-gallon and 55-gallon bulk products are made-to-order and are non-refundable. A small quantity can be provided as a free trial sample before ordering. No special shipping charges required for ground aerosol shipments. Air shipments may require extra charges and paperwork as determined by carrier. UPS may impose a hazmat fee per cylinder or bulk container for ground shipments. Air shipments of cylinders are not allowed by UPS. Prices shown are for U.S. customers only. International customers, contact your local sales representative or Slide Products for pricing. Slide may share information with an authorized Slide distributor who, in the future, may offer local support. Our most popular products combined into kits so you can try before you buy. Or build your own sample kit by ordering up to 4 products of your choosing. *Trial samples available only to qualified industrial users. One kit per order. Kit can not be ordered in combination with other samples. 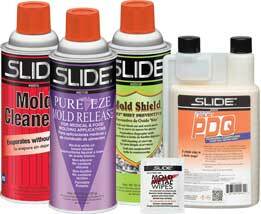 Mold cleaner, mold release, rust preventive, mold cleaner wipes and purging compound. 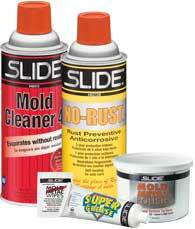 Mold cleaner wipes, mold cleaner, mold polish, rust preventive and ejector pin grease. 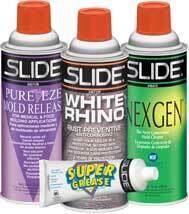 Mold release, mold cleaner, rust preventive and ejector pin grease.